Love the oversized comforter! Completely fills my king size douvet covers!!! Also, this keeps you SUPER warm, I mean SUPER warm. The Brookside Down Alternative Reversible Quilted Comforter features ultra-soft fabric and 275 gsm microfiber fill for the right amount of warmth and softness, but none of the allergy symptoms associated with goose down. 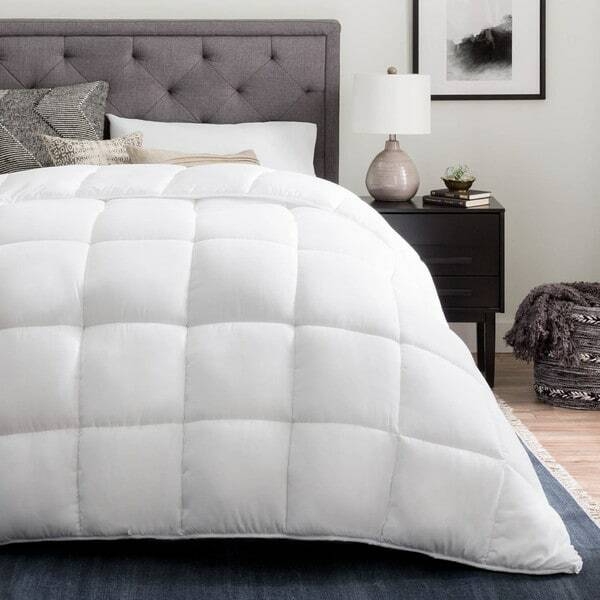 Quilted to keep fill from clumping, this comforter also features four corner loops to hold a duvet cover in place. It is machine washable and dryer safe for the ultimate convenience. Design Tip: If you like the look of comforter with extra drop over the sides and end of your bed, or if you have an extra thick mattress, we suggest you purchase a comforter one size larger than your bed. I previously reviewed the soft essentials duvet. I purchased this comforter to go inside the duvet. It arrived on the scheduled day. It is identical to the picture and is well made. It came with detailed instructions on how to care for it, however, I have not washed it yet and don't know how it will hold up after washing. It is the perfect oversize king insert at 112 inches wide and 96 inches long to go with the oversized duvet at 116 inches wide and 98 inches long. I was very lucky to find this comforter as it is very hard to find comforter inserts this size. I will be ordering another one to alternate during washings. I love everything about this comforter. I ordered the oversized queen: 98 inches wide x 98 inches long. It's soft. It's NOT too heavy. I'll be purchasing another shortly. I ordered white, but I wish they offered this in more colors. Best bang for your buck. Wasn't expecting too much due to the price, but ended up loving this one more than my alternative down comforter from Bed Bath &amp; Beyond that was 3x the price of this. So soft, really pretty and nice over sized. I ordered the California King because it covers the king size mattress to about half way down the bed. The size is 102 inches by 96 inches. I had no idea duvet covers could be XL of the actual size, but my clearance duvet cover purchase had me searching! Luckily I found this reasonably priced and oversized! It actually is much better than my previous more expensive insert. The best part is that it has ties so it will stay (somewhat) put once in the cover. Also, my hubby actually allows it on the bed during the summer months, which never happened before. It is lightweight, but warm if needed. I would recommend! This is super soft when you first get it. My son wanted one for himself when he felt it. I love the corner tabs- very secure. Just don't wash this on anything but cold or you'll get pilling like I did. Oops- no matter, I put it into a duvet now since it had the handy loops. I love this comforter. I got the oversized king and it fits great on my king bed. The length was normal, but the cover is wider. The comforter is also super soft. The price is great on this high quality comforter. This comforter placed inside the Duvet offers superior warmth. Tabs match perfectly and it eliminates the need for a top sheet. Very warm if you sleep in the buff, and allows you to lower the heat at night and stay warm. Adds comfort and cushion to my room. Came out of the box great. Washed up nicely and went into the duvet cover. Hangs well over the bed. Can't wait to crawl in under it! I like the fact I can switch colors as needed to add spank to the room, easy to wash. Keeps you warm in the fall. soooo warm and so cozy. My son feels he's got a 5 star bedroom now. very good quality. This is so very light, but will keep you VERY warm...sometimes you might think TOO warm. lol! Washes and Dries great, just remember to put a few tennis balls in the dryer to help fluff it back up. Extremely Great Price for this!! Fit perfectly on King bed with the right hang over I expected. This comforter is awesome. It's really warm without having to worry about any down allergies. The description was on point! I'm sure it will be enjoyed for many years to come. Great alternative comforter, light weight. As commented by another reviewer came vacuum sealed and did have a slight odor that vanished after I washed. Good value for the price. I would recommend this product to a friend,looks really great in my extra room! Nice and light. Fabric is silky and soft. It’s soft, light and comfy. Great value! The quilt is incredibly thin and made of cheap fabric. Super fluffy and well made. Totally transformed my teen's bed from unkempt to cool. Fits well. Would buy more as needed! Nice touch to have the flexibility to use as a blanket on its own or with a duvet. Great! Lightweight & comfy so doesn’t make us overheat at night. "How does it hold up in the washer? Does the filling bunch up?" All of mine have held up great since I bought mine. The stitches that make the squares keep it from bunching up. When all care instructions are followed and oversized appliances are used, this comforter launders great. And the baffle design of this comforter keeps the filling even and prevents bunching. "What are the length and width of a full size comforter?" "which color is the striped one"
There are two colors with stripes; Costal Gray/White stripes and Calm Sea(light blue)/White stripes. "Can I get the matching shams for sand/ mocha color?" I am actually not sure. It might be best to contact Overstock customer service for the answer to this question. If they can’t help ask who the manufacturer is so that you can contact them. Good luck! No, we do not have shams for these. "What are the dimensions of an xl king comforter?" Oversized King: 116 inches wide x 98 inches long. "Can you please tell me the differs between twin and extra large twin?" The Twin is 68 inches x 86 inches and the Twin XL is 68 inches x 92 inches. "Does it have tabs in each corner "
Yes it does. and this quilt is GREAT!